Mulberry & Moss one of my sponsors has a lovely collection of vintage inspired stationery. Take a look at their fun items. 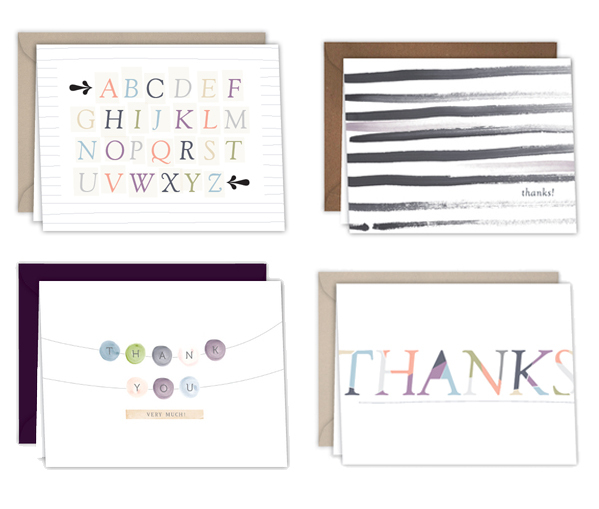 My favorites are the alphabet cards and variety of thank you cards, especially the watercolor one! *If you would like the become a Black Eiffel sponsor -- email blackeiffel@gmail.com for details. My rates are catered for small businesses and from now until the end of the June 20% of all individual ad proceeds will be donated to the Japan relief. Super cute! I love the thank you garland one. Sp sweet! So great to see Mulberry & Moss on here! They did my wedding stationery and I've gotten rave reviews! I recently chatted with my neighbor-friend about how the "art of the drop in" was nearly lost. No one dreams of just knocking on a friend's door without a text, call or email first. Wouldn't life be more exciting if friends dropped in unannounced more often? I think so! And, I think mail would be more fun if we still sent beautiful, handmade cards! these cards are lovely! i love the black and white "thank you" one!